Steve Reiners Associate Chair of the Horticulture Section — and Professor starting the first of the year. One of the truly great pleasures of this job is being able to recognize our faculty and staff who have achieved wonderful things. I’m writing today to congratulate you (Steve Reiners) on achieving the status of Professor. Well-earned. Congratulations! This promotion will be effective January 1, 2015. 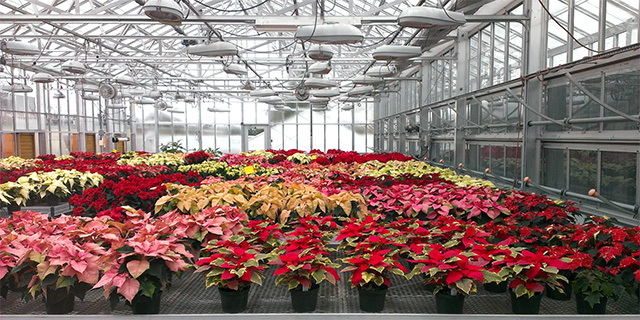 Hortus Forum poinsettia sale is on! 32 varieties. 2 pot sizes. Online ordering. What more could you ask for? Visit Hortus Forum’s Facebook page or go directly to the club’s online ordering page to view your options. 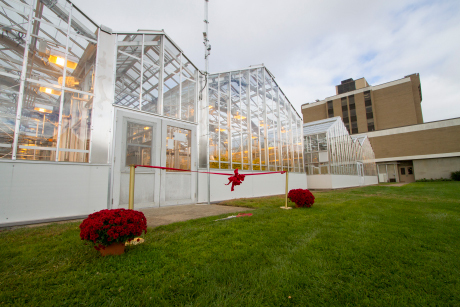 Each fall, associate professor Frank Rossi introduces students to plants grown for food, beverages, fiber, aesthetics and recreation in HORT 1101 (Horticultural Science and Systems). 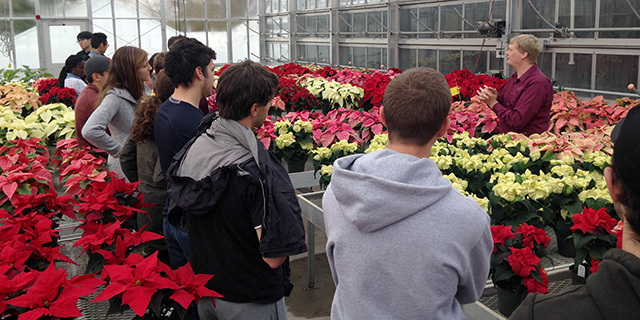 Last Friday, with the help of associate professor and greenhouse horticulture specialist Neil Mattson, those students got a firsthand look at the various operations at Kenneth Post Lab greenhouses, including viewing poinsettias grown by Hortus Forum, Cornell’s undergraduate horticulture club and Wee Stinky, the about-to-bloom titan arum that is part of the Liberty Hyde Bailey Hortorium‘s collection. View more HORT 1101 posts. ‘Wee Stinky’ at dawn November 14. 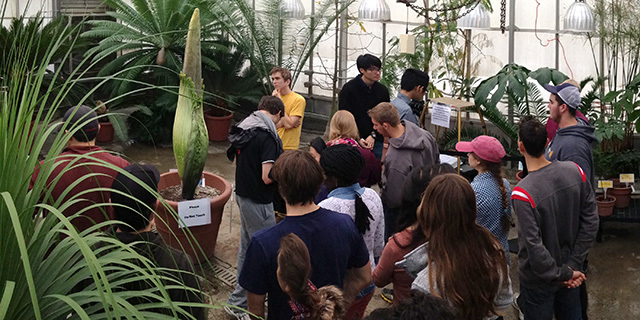 While it is difficult to predict exactly when, the Cornell University Titan Arum (dubbed ‘Wee Stinky’ when it flowered for the first time in March 2012) is poised to flower again. Visiting Hours: 9:00 a.m.-4:00 p.m. Hours will be extended once the plant blooms. For updates watch our Twitter and Facebook feeds. 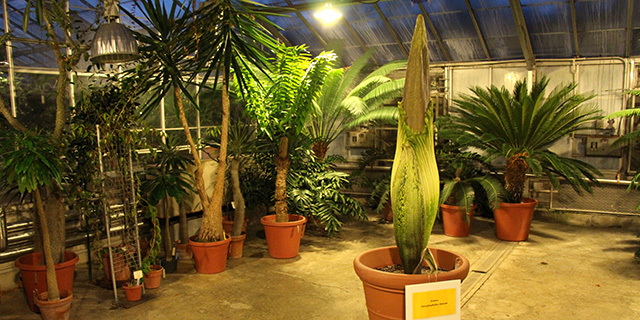 You can also view the titan arum on a live webcam, track its growth in numbers and images, and read updates on our blog. 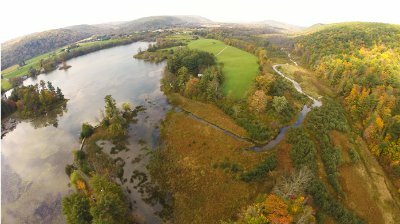 Cornell Daily Sun science editor Kathleen Bitter previews the impending bloom in ‘Wee Stinky’ to Bloom For First Time Since 2012. 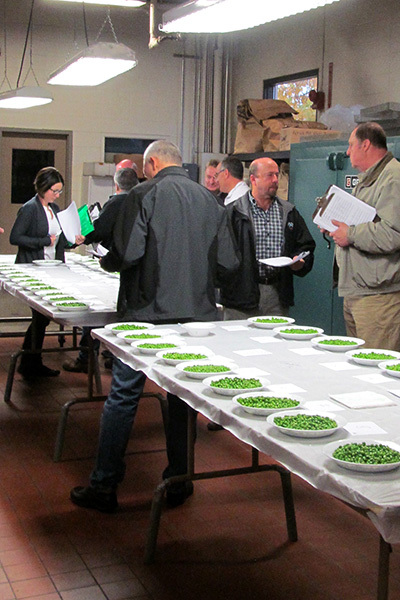 Processor and seed company representatives sample frozen peas at NYSAES ‘cuttng’. More than 40 people attended the annual fall processing vegetable ‘cutting’ November 6 to sample and compare canned and frozen peas, sweet corn, and snap beans trialed at the New York State Agricultural Experiment Station, Geneva, N.Y.
“It was the best turnout we’ve ever had,” says Jim Ballerstein, the research support specialist who manages the processing vegetable trials. Attendees included representatives from processing and seed companies, including the top three vegetable seed companies in the world, adds Ballerstein. The cutting included samples of 50 pea cultivars, 55 snap beans (canned and frozen), and 63 sweet corns (frozen kernel and whole ear). 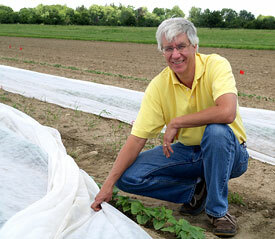 Learn more about processing vegetable trials at NYSAES. 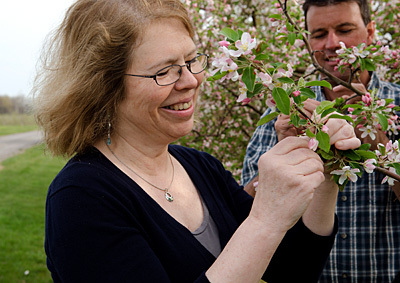 Tune in this afternoon to hear Susan Brown, associate director of the New York State Agricultural Experiment Station (NYSAES), discuss Apple Science, From American Beauty to Zestar on Science Friday. The show runs from 2 to 4 p.m. on public radio stations across the country and we expect Susan to be on during the first hour. (Likely around 2:20 p.m.) You can listen locally on 89.5 FM in Geneva or on 91.5 FM in Ithaca. You can also stream it on ScienceFriday.com or listen to the podcast after the show airs. The humble apple wears many faces, from the crisp and crunchy Honeycrisp to the soft and tannic Mac. How did apples get so diverse? Apple breeder Susan Brown explains the ins-and-outs of apple reproduction and reveals how modern plant genetics allows her to “stack the deck” in favor of crisp and sweet offspring. Plus, orchardist and apple historian Dan Bussey introduces us to some weird and wonderful heritage breeds. If you missed today’s seminar, Developing LED Photosynthetic, Photomorphogenic, and Photoperiod Lighting Applications for Horticulture Crop Production, with Roberto Lopez, Associate Professor of Horticulture, Purdue University, it’s available online. Old barn foundation at the Bassuk-Trowbridge garden. 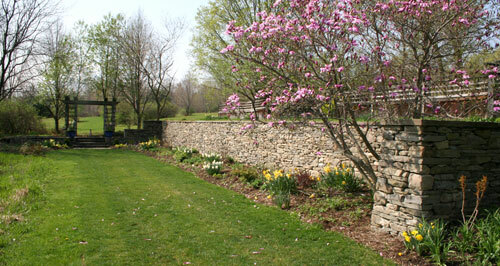 If you’ve ever visited Nina Bassuk and Peter Trowbridge‘s garden during their annual Daffodil Day open house and wondered what went into its design and construction, don’t miss Behind the Scenes in the Bassuk-Trowbridge Landscape in Taking Root, the newsletter and blog of the New York State Urban Forestry Council. The article also details Nina and Peter’s bulb-planting practices, focus on foliage, and — of course — matching plants to challenging soil and environmental conditions. In other recent posts, Nina discusses the early history of the New York State Urban Forestry Council and extolled the virtues of ‘White Shield’ Osage orange (Maclura pomifera).